We left Cowra early Friday morning - it was slightly chilly and still below 10 degrees - last night was almost a frost as we woke and had breakfast sitting in 3-4 degree weather! We left early as we knew that we would have a tough day ahead of us with the bulk of the day climbing. Although we started at 310m above sea level and ended the day at 489m above sea level which is a climb of around 180m - although that doesn't seem like much but you have to remember that in Australia you go up, down, up, down, up to gain any height! 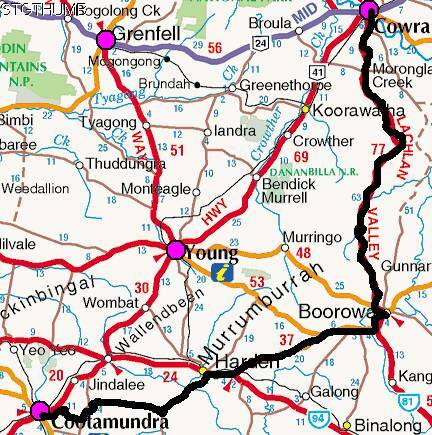 So basically the day involved the following - first 15km we cruised nicely along, next 15km was climbing gently then a 5km downhill, then the next 25 - 30km was undulating (mainly up) then a 5km down and the rest along to Boorowa. As you can see Kouta was sitting comfortable the whole way and did not struggle at all with the hills! Actually it wasn't too bad as the climbing was gentle in places and only one or two hills that were a little steep but ridable. The Lachlan Valley way which is the road we took was really good - a little rough in patches but otherwise it is an excellent road again. We even had a shoulder for the bulk of the journey today and even that was in good condition! Not alot of traffic and they tended to come in dribs and drabs. Along the way we came across this field full of purple flowers called Pattersons' curse - not sure if it is a good thing in this field or not! All the other fields were either full of the usual - cattle, sheep or canola - although the canola wasn't as bright as the ones North of Cowra. We got to the town of Boorowa and the caravan park is nice, with new laundry and toilet facilities. Boorowa is a nice town, a bit like Beechworth, where the bulk of the town is made up of cafes and boutique shops open Fri, Sat and Sun - I think they get alot of weekend folk from Canberra etc. that stay here for the weekends. The town itself is very pretty and well kept, the buildings are nicely presented and the streets are clean and almost look new! Our spot in the park was nice, we chose under a pine tree (to protect the tent from a frost) and near the back fence so that we overlooked the bike path and also because it had these lovely cherry blossom trees. Most towns we go through now have these lovely cherry blossom trees everywhere and Boorowa had heaps of these in their parklands. We woke this morning and it wasn't cold at all and the tent was relatively dry from being under the pine tree. We weren't quite sure what todays ride was going to bring all we knew was that it was going to be around 80km so we started out early. We continued on the Lachlan Valley way for a few kms and then turned right to take a very quiet road to Harden which was 40km away. This road was nice and quiet with hardly any traffic. It had relatively easy gradients for the hills and the cycling was great. About 5km out from Harden we join the main road that runs between Yass and Cootamundra so there was a marked increase in traffic. We had a cuppa at Harden and then decided to take the real small quiet roads to Cootamundra rather than stay on the main road. they were the same distance so that didn't matter but I tell you the main difference (I think) was the hills! I knew that it would be hillier than going the main road but I didn't think it was be that much hillier!!! These hills were absolute killers! They were very steep that even Neil let out a few umphs and grunts!!! Despite the undulations and steep climbs there was no traffic (maybe 10 cars passed us over the 40km) and the views were fantastic. It was beautiful when you got a field of purple next door to a field of canola yellow! I think Neil took this photo just so he could stop and pull over to take a break from the hills in the afternoon! We think this might be a field of Lupin - not quite sure as we had never come across a field like this. Not far out from Cootamundra we came across this tree - we tried to think of something to add to it but we couldn't give anything up and besides the branches were too high for us to reach and put something on! One thing I forgot to mention was that just out of harden at the top of one of the hills and just as I started to go down I decided to stop looking at the road like I normally do and look up and admire the scenery ... so here I was looking around and then all of a sudden Neil yells out "Janet there is a snake up ahead" so I slow down and see that it is crossing the road about 40m ahead so plenty of room for us and it. So it wiggled its way across - it was around 1.2-1.3m long and it was an orangy brown colour. Speaking of wildlife one thing we have noticed with the cattle lately is that you are riding along and you look at the fields of cattle and they are ALL looking at you - I tell you it is a bit like being in a horror movie - just what are the cattle thinking about us! next thing you know they have all bolted and running across the field - I remember one was (well we think she was) pregnant still! We got to Cootamundra eventually, very tired and worn out and Neil is vowing to seek a flatter way to Wagga Wagga - he admits that he is sick of the hills and would just like a piece of flat road for once! I must admit that I agree with him - I have gotten use to the hills and can confidently ride them but I am sick of them! We have been here before and this town has a Woolworths which Neil went and got dinner and a cake (which by the way we had 1/2 for afternoon tea and the other 1/2 for dessert!) lucky it was a bakery markdown! Kouta has his own football club! of course they spelt it wrong! Actually what I find funny about this sign is that the emblem is similar (if not the same) as the Carlton Football club and our little Kouta is named after Anthony Koutifedes (spelling?) who use to play for Carlton Football club! Next to the caravan park is a park which has the Australian Cricket Captains walk - similar to the Prime Ministers of Australia walk in Ballarat. Anyway since Cootamundra is famous for the birthplace of Sir Donald Bradman who was a popular cricketer (an excellent batsmen with a test average of 99.94 runs). ... this is Greg Chappell (aka 'the cheater') and I am sure he is the one responsible for the 'under arm' bowling technique used in the match against NZ all those years ago!!!! do you think I need to 'let it go'?